A normal Tuesday show with people not being so good. Tonight’s CMLL show a relevos increíbles listed as the main event, but it’s really everyone playing the sides they should be on. Thunder teams with sorta-rudos Rush & La Sombra against Diamante Azul, Volador and sorta-tecnico Ultimo Guerrero. The twist is Thunder’s turn happened because he wanted to fight Rush, and now they’re going to happen to team. Semimain has Rey Escorpion versus Gran Guerrero, which probably should be Escorpion getting a big win to prove he’s got a chance to beat heavy favorite Ultimo Guerrero in the mask match, but it might just turn out to be an angle instead. (They’ve already done the switch once.) En Busca de un Idolo has Disturbio versus Canelo Casas and Delta versus Guerrero Maya Jr. match between long time partners. It’s not the first match between the tecnicos: they got put together after they faced off in a similiar 2011 Forajido de Idolo tournament block, and Delta won way back then. Flyer got the full 40 points for first, catching up 27 points on Esfinge (13) and 22 on Disturbio (18). He’s been treated as the lowest man in the decisions (the only guy with an under 500 record), but could end up being the guy who gets brought thru via fan support. Tonight’s Disturbio/Canelo match outcome could swing things. They got the same fan votes, they’ll probably be near each other in judging points, it’s the 20 points decision that could weigh big. AAA is also taping tonight, in Tampico. 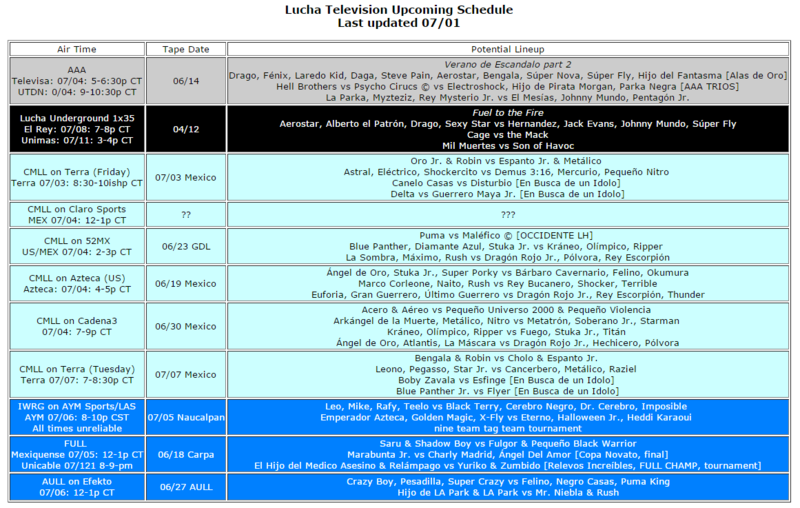 Now that TripleMania’s date has been announced, this is the show to start to announce some matches for the show. Mistico and Averno face off in a singles match for no apparent reason in the semimain, which suggests there’s a plan there for a TripleMania match. Brian Cage and Alberto el Patron will definitely be wrestling at TripleMania, but tonight they’ll team up to face the equally odd couple pair of Blue Demon & Villano IV. Mascara Ano 2000 Jr. makes his first AAA TV appearance in a year, so his mystery admirer storyline may finally be explained. A bunch of AAA wrestlers who would normally be on the taping are instead in Tijuana for The Crash. Pentagon Jr. accused Rey Horus and Bestia 666 of not showing up for the press conference for the show because they were scared of him. Rey Horus isn’t even in Pentagon Jr.’s match (he’s in a four way with Extreme Tiger, Bestia and ACH), but Pentagon is just that scary. Everything can be worked around, but it doesn’t look great. No one with Lucha Underground is saying they’re not coming back for season 2 or not coming back, but they’re also not really saying much at all. There’s still people who will say ‘it’s close, news is coming soon’, but they’ve been saying that for months and there’s been no news. It’s not dead yet. AAA luchadors were at the premiere of Terminator: Genisys Wednesday. Rey told the press he watched the Santo/Demon movies when he was young and would like to be in one. Ultimo Dragoncito says when he first wanted to start training lucha libre, he was rejected for being too short. He was told that if he really wanted to be a luchador, he should go prove it by doing amateur wrestling, and Dragoncito did for many years. He still was rejected from being luchador until a Guadalajara promoter needed some new wrestlers, with Dragoncito only getting a spot because they needed one more to round out the field. He did well and eventually became Misteriosoito in 1989. Misteriosito got caught up in the big CMLL/AAA split in 1992; most all the minis went with Antonio Pena and his new company. Dragoncito said he never did (though there’s at least one early AAA card with a Misteriosito billed), but stopped getting booked and didn’t know what had happened. It took him months to get the courage to ask Paco Alonso about his situation, only to find out Paco had assumed Misterioso jumped with the others and that’s why he wasn’t booked. Paco did make it up with him by paying Dragoncito for his down time, giving him the new Ultimo Dragoncito gimmick and bringing in more minis to work with. Boby Zavala is thrilled to be leading the En Busca de un Idolo, and Delta & Guerrero Maya should be less worried about their fan’s votes not counting on the form and more concerned about making their matches less boring. Fantasma kept the IWL title over Mr. Jack in Arena Aficion. +LuchaTV has full match video of the Dinasita Casas vs Dinastia Crazy and Rush & Mr. Niebla vs Hijo de LA Park & LA Park from the recent Lucha Libre Boom show. Rob has a music video of 03/10/15 CMLL. Segunda Caida reviews Infernals vs Familia de Tijuana from October 4, 2002. Promo from Mike & Leo for the Lucha Mutante show. Valiente & Dragon Rojo will be at the Mexico national bodybuilding contest this weekend. SuperLuchas looks at the current champions and reigns at the half year mark, wonders why CMLL has so many championships. Profile of Chihuahua’s El Novato. 2) Fénix vs Pentagón Jr. Somewhat surprised we’re getting a lineup. The UK gets Fenix versus Pentagon Jr., which is pretty cool. They’re probably not getting Texano and no idea how they work around that. unclear if it’s an atomicos, just listed as team vs team. 6) La Máscara, La Sombra, Marco Corleone vs Máximo, Último Guerrero, Volador Jr.
Lucha Libre Boom, using CMLL’s wrestlers and IWRG’s building. Slightly confusing. CMLL’s not aired matches with outside talent on All Elite shows in the past, this All Elite show had outside talent on every single match, who knows what they’re going to do. Maybe Puebla airs on 52MX and GDL moves to there? Maybe they just air a random episode from the past? I hope Puma’s big win turns up anywhere. He only gets one every three years. Alas de Oro is must see – but it seems like AAA’s posting shows on a one week delay now, so you’ll be stuck going to my channel to see it. The commercial for next week’s Lucha Underground makes it seem very exciting! They still haven’t aired the other half of the All Night Long taping, which makes life really hard when you don’t want to post results from a taping until all the matches have aired.